Some 500 years ago, in order to ensure that Moorish invaders would not return without them noticing, the then leaders of Spain decided to take back two cities on the Moroccan coast by military force and occupy them. Ever since then, Mellila and Ceuta have been geographically located in Africa whilst legally belonging to Spain. For those immigrants that cannot afford a boat trip to the Spanish mainland, a group assault of the fence surrounding any of those Spanish enclaves is one of the best options to get an asylum application going. Related coverage: <a href="https://thegoldwater.com/news/39691-Spain-Drug-Cartel-Leader-Arrested-After-Cameo-In-Bikini-Filled-Reggaeton-Clip-Video"> Spain - Drug Cartel Leader Arrested After Cameo In Bikini-Filled Reggaeton Clip (Video)</a>. However, seeing that more and more migrants tried to enter Europe in this manner, Spanish conservative governments placed a high fence complete with barbed wire around the cities, wounding many that tried. Noticing the images of bloody Africans all over European newscasts, the minority socialist government of Mr Pedro Sanchez had vowed to take away the barbed wire which sits on top of the fence over the summer, but so far had failed to execute on this promise. And so when 300 migrants stormed the fence simultaneously on Sunday, 1 man died and 19 were left wounded. Some 200 of them made it into Spanish territory unharmed. One of the men who climbed over the fences died of an apparent heart attack despite efforts to revive him. Nineteen others were being treated for fractures or cuts sustained while scaling the fences, authorities said. On the Spanish side, six Civil Guards sustained non-serious injuries during the rush at the border fence. Ever since Italy started turning back migrant boats since the election of rightwing populist leader Mr Matteo Salvini, Spain has seen a large increase in the number of migrants that arrive from Africa. According to refugee NGO statistics, some over 48,800 migrants and refugees have entered Spain so far this year, much more than those entering Italy and Greece. 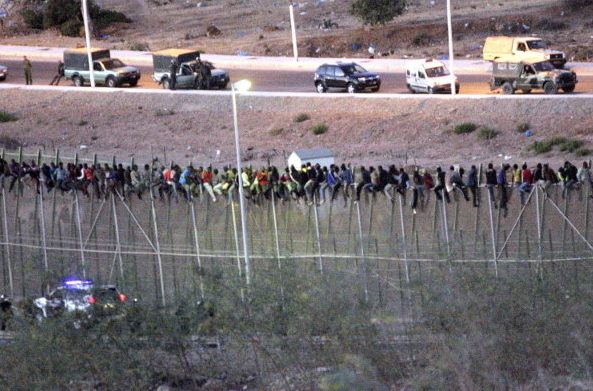 Over 4,000 have entered Spanish territory in 2018 by crossing the fence into Melilla. These hordes are not immigrants, they are invaders. Any other mindset & ultimately control will be lost, to these heathens. For every inch given they take 10 miles & then proceed to take 100 more.